I have a great love of books. Whenever I get the chance I like to wander through book- stores and see what catches my eye. In particular, I enjoy children’s books, because they often address important issues in a simple and direct manner, with the added element of delightful pictures. I recently discovered a children’s book entitled “The Five Senses of Love” by Janet Parsons and Claire Richards. It is a simply told story of how a child perceives love through each of her five senses. She can see the love her mom’s eyes when she tells the story of the night she was born. She can hear love, when she is running a race and she hears someone in the crowd call her name. She smells love, when her grandmother comes to visit and hugs her in cloud of perfume. She can taste love in the lunch box that her father fixes for her and she can feel love when she is wrapped in a warm, safe bear hug. Children first learn about their world through their eyes, ears, nose, mouth and the ability to feel. It is through these five sensory systems that we initially bond with others and form attachments. Science informs us that a baby, shortly after birth, can distinguish and respond to the unique smell of their mother. Paying attention to sensory information can keep us present in the here and now. The more you can stay in the moment, the more you can engage with your child, spouse or significant other. I remember reading once that “The true gifts in life live in the moment. That is why we call it the present”. Sit down with your child, spouse, or significant other and each of you chooses a different color piece of construction paper. 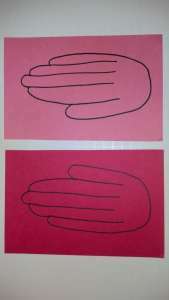 Each or you trace one of your hands as shown. 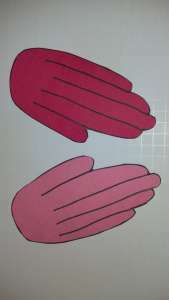 Next cut out the hands, remembering to cut between each finger. On each of the fingers write a sentence about how you sense love from the other person. (How you see, hear, smell, taste and feel love from the other person). For example, I hear love when I hear a big belly laugh etc. When each of you finishes, take a few moments and share what you wrote. 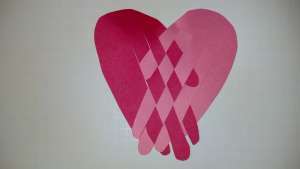 Place the hands side by side, as shown, and weave the fingers together so that they form a heart. Remember, “The very best news about love is that it is absolutely everywhere, all of the time, and you can find it with any of your five senses”. Janelle Novell is co-founder of Novell and Novell Counseling Services. She is a Licensed Marriage and Family Therapist and a Registered Play Therapist-Supervisor who works exclusively with children ages 2-12. Play Therapy is a form of counseling or psychotherapy that uses play to communicate with and help people, especially children, to prevent or resolve psychosocial challenges.